4to. 104 leaves, black letter. Complete with the errata leaf at the end and rare correction slip for V4verso. In some copies the diagram on V4 verso is corrected with a pasted-on slip. In this probably unique copy, the slip is laid in loosely, so that the original erroneous printing is still visible. Numerous tables and diagrams, some colored in red. Original wallet-style limp vellum, wrap-around flap restored. Wear and soiling to binding and first few leaves, last several leaves lightly stained. Early annotations and calculations on free endpaper. A very good copy in original condition. “When ye shall measure a piece of any land ye shall go about the boundes of it once or twice, and [then] consider well by viewing it whether ye may measure it in one parcel wholly altogether or else in two or many parcels.” Measuring it in “many parcels,” he explained, was necessary when the field was an uneven, irregular shape; by dividing it up into smaller, regular shapes like squares and oblongs and triangles it became easy to calculate accurately the total area. The distances were to be carefully measured with a rod or pole, precisely 16 1/2 feet long, or a cord. And finally, the surveyor was to describe the area in words, and to draw a plat showing its shape and extent. “Like the maps, this interest in exact measurement was also new. Until then, what mattered was how much land would yield, not its size. When William the Conqueror instituted the great survey of England in 1086, known as the Domesday Book, his commissioners noted the dimensions of estates in units like virgates and hides, which varied according to the richness of the soil: a virgate was enough land for a single person to live on, a hide enough to support a family, and consequently the size shrank when measuring fertile land, and expanded in poor, upland territory. Other Domesday units like the acre and the carrucate were equally flexible, but so long as land was held in exchange for services, the number of people it could feed and so make available to render those services was more important than its exact area. Accurate measurement became important in 1538 because beginning in that year a gigantic swath of England-almost half a million acres-was suddenly put on sale for cash.” (New York Times 1 Dec 2002). Benese’s Maner of Measurynge All Maner of Lande marks an epoch, the widespread idea of land as private property. Under the feudal system, land was generally owned by the king. Everyone else, from duke and baron to vassal and villein, was a tenant exchanging goods and services for land rights. “During the sixteenth century a large part of the property of Europe was suddenly wrested from one privileged group and handed over to a new one. The Church was expropriated; the lands of feudal magnates, who opposed both capitalism and the new religion, and the ancient demesne lands of the Crown, were transferred by forced sale to the new ruling class” (Schlatter, Private Property, the History of an Idea). Suddenly land became widely available to capitalists. This sea change in the world’s economic order required that real estate dealings be put on a rational economic basis, and Benese’s book marks that new era. “If there is a single date when the idea of land as private property can be said to have taken hold, it is 1538. In that year a tiny volume was published with a long title that began, This boke sheweth the maner of measurynge of all maner of lande. In it, the author, Sir Richard Benese, described for the first time in English how to calculate the area of a field or an entire estate . . .
“[T]his interest in exact measurement was also new. Until then, what mattered was how much land would yield, not its size. When William the Conqueror instituted the great survey of England in 1086, known as the Domesday Book, his commissioners noted the dimensions of estates in units like virgates and hides, which varied according to the richness of the soil: a virgate was enough land for a single person to live on, a hide enough to support a family, and consequently the size shrank when measuring fertile land, and expanded in poor, upland territory. . . . Accurate measurement became important in 1538 because beginning in that year a gigantic swath of England––almost half a million acres––was suddenly put on sale for cash. “The greatest real-estate sale in England’s history occurred after king Henry VIII dissolved a total of almost 400 monasteries, which had been acquiring land for centuries. . . . Upon the monasteries’ dissolution, all their land, including some of the best soil in England, automatically reverted to their feudal overlord, the king [who needed money to defend England against the French]. The sale of so much land for cash was a watershed. Although changes were already under way, with feudal services often commuted for rents paid in coin, and feudal estates frequently mortgaged and sold, up to that point the fundamental value of land remained in the number of people it supported. From then on the balance shifted increasingly to a new way of thinking. Prominent among the purchasers of church property were land-hungry owners, like the duke of Northumberland, who had been enclosing common pastures, but far more common were the landlords who had done well from the rise in the market value of wool and corn, and chose to invest in monastery estates. “The new owners and their surveyors realized that the monasteries’ widely separated rigs and shares of common land would become more valuable once they were consolidated into fields. Their predecessors, the old abbots and priors, had understood landownership to be part of a feudal exchange of rights for services. But those who had bought their land knew that ownership depended on money passing hands, and that the old ways had to change if they were to maximize the return on their investment. . . .
“The emphasis in Benese’s book on exact measurement reflected the change in outlook. Once land was exchanged for cash, its ability to support people became less important than how much rent it could produce. And to compare the value of rent produced by different estates, it was essential to know their exact size. The units could no longer vary; the method of surveying had to be reliable. The surveyor ceased to be a servant and became an agent of change from a system grounded in medieval practice to one that generated money” (Linklater, Measuring America, Chapter One, The Invention of Landed Property). Benese was the last canon of the Augustinian monastery at Merton, and he surely was involved in the dissolution of the monasteries. He became Surveyor of Works at Hampton Court and chaplain to Henry VIII. 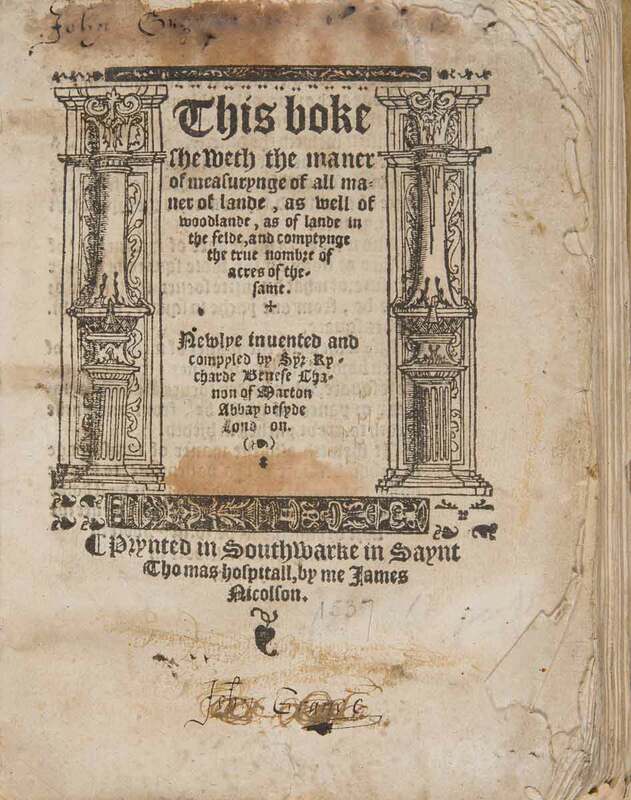 This is the first English book on geometrical surveying and the second English book on surveying of any kind, preceded only by John Fitzherbert’s Boke of Surveying (1523). For Fitzherbert, surveying carried its literal meaning from the French, overseeing, looking over the land to determine its use. It was Benese who showed how to determine the area of the land (and surveying has denoted measurement ever since). RARE. This is a splendid copy in original condition. No unrestored copy has appeared for public sale since 1932. STC 1873 (giving date 1537? ).